There is a quite small choice of physical free world maps in Internet, which are in square shape. The following derivatives and them input map are some of such map images. Please read also the topic of license and disclaimer of using the maps (click here), before printing or downloading the maps in this gallery! 1. This physical map has been made brighter (brightness +40), than was the source map. 2. This is a physical map, which all colors have blue shades. 3. A physical world map, with only green-tone colors. The source map for the derivatives of physical world maps has been made with the Windows software Alternative World Map Creator 1.0.1. Author of the source: The copyright holder of this software is Peter Moor. Licensing of the source map: By downloading, there has been written (in December 2008): "License: Free" ... "Limitations: No limitations". If the software is for free using, then it seems, that also the map, which has been created by this software, is for free. Be more sure of the using possibilities of the source map by visiting the website of the source software and from there the download website. Link: Source of the Physical world maps. Dimensions: this software creates physical world maps with 1000 x 500 pixels (this has been used for the modified pictures in this gallery) and with 1600 x 800 pixels. Thoughts by creating the derivatives: This source map has quite dark shades of colors. 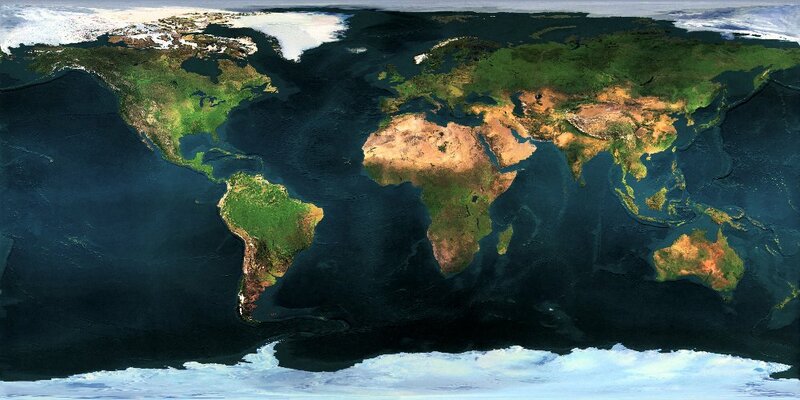 Probably this is realistic for the Earth, but by graphical design or by printing one can prefer brighter colors. That's why brightening modifying have been done. Click on the following map to go to the more suitable site for printing and downloading the source map! Hopefully you found a suitable world map from this choice of physical maps gallery. If not, then we hope, that you find something from the other galleries, on our website free-world-maps.com.